Yesterday, I'd posted an inspiring poem that I came across while twiddling my time over the internet. If you have read 'Don't Quit' and can associate yourself with its purposeful lines, I am so glad and grateful that I have done a little goodness out of my laziness. Just like me, you have an ambition. You have a goal to achieve. However, what you want may seem to be dragging their feet or perhaps situations may seem to be running a little off course. In my case, I'm a little lost for direction at the moment. Well, no point beating yourself up. You may just be working too hard. 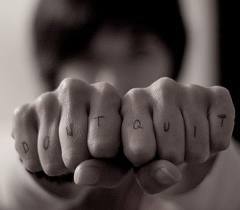 "Rest, if you must, but don't you quit!" after a person refuses to quit! Your mind is a powerful tool. Remember, if you think you can or even if you think you can't ... either way, you are right! Have faith and patience that everything you create in your mind becomes your reality eventually. Believe me, personal experiences attest it's true! The law of attraction works on how you feel about the thoughts you carry and the experiences you are going through in your life. The feelings that you resonate with will attract the outcome you are moving towards. Be happy and focus on the positive aspects of your life and soon you will have more to be happy and positive about. So take a break and re-examine your priorities, your thoughts and your feelings. The law of attraction is not a substitute for hardwork. It is simply a tool to train your mind to help you reach your goals. Fast or slow, it is entirely up to you. "Don't give up though the pace seems slow, you may succeed with another blow."